Product Description: A high quality water reducible modified acrylic vehicle pigmented with Titanium dioxide or appropriate lead free coloured pigment. Intended Uses:A fast drying, tough, non-yellowing interior/exterior Eggshel,Semi-Gloss and Gloss coating suitable for architectural, institutional and industrial service including moderately corrosive environments. Performs well on concrete, masonry, vinyl siding and suitably prepared and/or primed drywall, wood work, and metal. For use in Hospitals, Schools, Public buildings, Pulp and paper mills & Petro chemical plants. 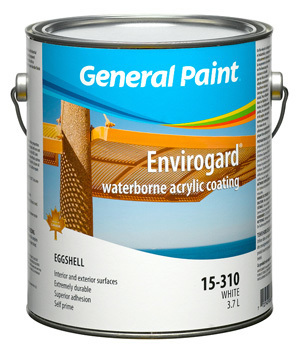 Provides a much tougher, more durable finish than conventional latex and alkyd finishes. Due to its exceptional adhesion, it can be used as a self prime finish on most non-porous substrates.